Dep. of Geol., University of Leicester, U.K. Figure 1. Simplified geological map of the Siberian Craton anf the West Siberian Basin. Line "a" represents the maximum estimate of the area of basalt buried beneath the West Siberian Basin. Locations of Triassic basalts, which are likely related to the Siberian Traps, are in italics. The Siberian Traps (ST) is the largest known Phanerozoic continental large igneous province (LIP), and coincides with the most catastrophic mass extinction event, the end-Permian crisis. The present day area of the basaltic flows and volcaniclastic rocks, mainly exposed on the Siberian craton, is about 0.34 million km2, but combined with related intrusive rocks the ST cover an area of 2.6 million km2 (Fedorenko et al., 1996). Estimates on the volume of these rocks are difficult to derive, but may be as much as 1 x 106 km3 (Lur’ye and Masaytis, 1964; Fedorenko et al., 1996). The volcanic province on the Siberian craton is generally subdivided into four distinct geographic regions: Noril'sk, Putorana, Nizhnaya Tunguska and Maimecha-Kotuy (Fig. 1). Due to the occurrence of rich Cu–Ni sulphide deposits in the Noril'sk region, the volcanic sequence has been studied extensively (e.g., Zolotukhin et al., 1986; Lightfoot et al., 1990, 1993; Wooden et al., 1993; Hawkesworth et al., 1995). The age of inception and the duration of volcanic activity in this igneous province are topics of active research. 40Ar/39Ar ages on the volcanic rocks are around 250 Ma (Renne and Basu, 1991; Dalrymple et al., 1995; Renne et al., 1995; Venkatesan et al., 1997). These ages are indistinguishable from 40Ar/39Ar ages of the Permo-Triassic boundary (Renne et al., 1995). Estimates for the duration of volcanism range from 0.6 Myr (Campbell et al., 1992) to 1 Myr (Renne et al., 1995). U/Pb ages from intrusive rocks in the Noril’sk region (Kamo et al., 1996) and alkaline flows of the Maimecha-Kotuy area (Kamo et al., 2003) are in good agreement with the reported 40Ar/39Ar results. The eruption of such a large volume of basalt in a geologically short time period has led many authors to suggest that the ST were formed by melting of a hot mantle plume (Sharma et al., 1992; Arndt et al., 1993, Wooden et al., 1993). Regional uplift should have occurred prior to the onset of this voluminous volcanic activity. However, evidence for uplift is lacking in the accessible sedimentary cover beneath the ST (Czamanske et al., 1998). Saunders et al. (submitted) argue that the main locus of uplift during Permo-Triassic times was located in the West Siberian Basin (WSB), rather than on the Siberian Craton. Alternative models relate the ST formation to a bolide impact (Jones et al., 2002), lithosphere delamination (Tanton and Hager, 2000), or enhanced mantle convection at the edge of the Siberian craton (e.g., Anderson, 1994; King and Anderson, 1995, 1998; Puffer, 2001). Sharma (1997) provides a detailed review of many of the published models explaining the formation of the Siberian Traps. Basaltic rocks of Triassic age are reported from the Kuznetsk Basin (Kruk et al., 1999, Nikishin et al., 2002) to the southeast and from Chelyabinsk to the southwest of the WSB (Tuzhikova and Kurbezhekova, 1973), and in the Kushmurun graben in the Turgay basin, NW Kazakhstan (Fig.1). The western boundary of the LIP with abundant basalt flows can be traced from Chelyabinsk and the Kushmurun graben to the north into the North-Sosva Triassic graben (Fedorov et al., 2004, Ivanov et al., 2004). Farther north, vast Lower Triassic basalt flows are mapped in the Chernyshov and Chernov ranges and in the adjoining basins of the Polar Urals (Tuzhikova and Kurbezhekova, 1973; Andreichev, 1998). Seismic CDP data reveal in lower levels of the deep East Barents basin graben structures and basalt flows of probably Triassic age (Shipilov, 2004). The northernmost area where Triassic basalts are reported is the Franz-Joseph Land archipelago (Shipilov, 2004). The eruptive ages of the basalts along the whole western boundary of the LIP are mainly constrained by paleontologic and few Rb-Sr data and require confirmation by high-precision isotopic age determinations. Contemporaneous basaltic dikes crosscutting the Traps are reported from the Siberian craton (Bushkanets et al., 1970; Hawkesworth et al., 1995; Kamo et al., 1996; Ernst and Buchan, 1997). Triassic dolerite sills from the Kansk-Taseevskaya basin to the south of the craton are also related to the ST (Ivanov et al., submitted) and may substantially add to the entire volume. Basaltic and rhyolitic rocks are reported from several large igneous provinces and the volcanic activity is therefore described as bimodal (e.g., Paraná). Lyons et al. (2002) argue that rhyolites from the Semeitau Igneous Series to the southwest are also related to the Siberian LIP on the basis of paleomagnetic data and 40Ar/39Ar ages (249 Myr.). However, rhyolites are not reported from the Siberian Traps and have only been recovered from a few boreholes within the WSB and outcrops near Chelyabinsk (Fig. 1). The Siberian Traps volcanic activity coincides with the Permo-Triassic mass extinction. Several authors have proposed that the flood volcanism may have triggered the mass extinction (e.g., Renne and Basu, 1991; Campbell et al., 1992). The precise causal links between volcanic activity and climate change are not understood (Erwin et al., 1994; Twitchett et al., 2001) and it is therefore of critical importance to constrain the total erupted volume and eruption rates for the ST as accurately as possible. These data could be used to model the impact of LIPs on the palaeoclimate, and investigate the effects on plant and animal life. Furthermore, constraints on the volume, extent and rates of magma extrusion in the ST are important to explain the generation of such sustained and extensive flood basalt provinces. In particular, the relation and contribution of intrusive rocks to the ST event needs further evaluation. The Siberian LIP appears to cover an enormous area and represent a large volume of igneous material, and we are just beginning to understand their complexity. Duration of the volcanic activity and estimates of volume are crucial for any model explaining the formation of this large igneous province. Key questions remaining include: Is the volcanic activity short- or long-lived, and are contemporaneous extrusive and intrusive rocks also related to the same event or mechanism? The difficulties arising from these investigations, and the implications they might have challenge our understanding of LIPs. Evaluating the extent and duration of possible related volcanic and magmatic activity is therefore an important task for the future. Anderson, D. L., Earth Planet. Sci. Lett. 123, 269-280 (1994). Andreichev, V. L., The Geology of the European North of Russia, Syktyvkar (Transactions of the Institute of Geology) V2, 35-60 (1998). Arndt, N. T., Czamanske , G.K., Wooden, J.L. and Fedorenko, V.A., Tectonophysics 223, 39-52 (1993). Bushkanets, Y.S., Nevskaya A.V. and Belyakov G.D. 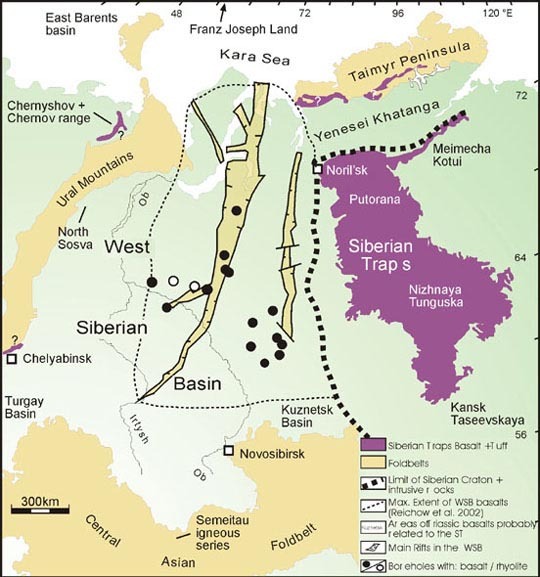 In: Geology and fossil minerals of northwest of Siberian Platform. (Nedra, Leningrad) V2, 124-139 (1970). Campbell, I. H. C., G.K., Fedorenko, V.A., Hill, R.I. and Stepanov, V., Science 258, 1760-1763 (1992). Czamanske, G. K., Gurevitch, A.B., Fedorenko, V. and Simonov, O., International Geology Review 40, 95-115 (1998). Dalrymple, G. B., Czamanske, G.K., Fedorenko, V.A., Simonov, O.N., Lanphere, M.A. and Likhachev, A.P., Geochimica et Cosmochimica Acta 59, 2071-2083 (1995). Eide, E. A., Walderhaug, H.J., Torsvik, T.H., Inger, S. and Scott, R., (submitted). D. H. Erwin, Nature 367, 231-236 (1994). Ernst, R.E., Buchan, K.L. American Geophysical Union, Geophysical Monograph Series, vol. 100, pp. 297-333 (1997). Fedorenko, V. A., Lightfoot, P.C., Naldrett, A.J., Czamanske, G.K., Hawksworth, C.J., Wooden, J.L. and Ebel, D.S., Interantional Geology Review 38, 99-135 (1996). Fedorov, Y. N., Ivanov, K.S., Kormiltsev, V.V., Zakharov, S.G., Pogromskaya, O.E. and Surina, O.V., In: Evolution of the tectonic processes in the Earth's history. Novosibirsk, GEO, 231-233 (2004). Gurevitch, E., Westphal, M., Daragan-Suchov, J., Feinberg, H., Pozzi, J.P. and Khramov, A.N., Earth Planet. Sci. Lett. (1995). Hawkesworth, C. J., Lightfoot, P.C., Fedorenko, V.A., Blake, S., Naldrett, A.J., Doherty, W. and Gorbachev, N.S., Lithos 34, 61-88 (1995). Ivanov, K.S., Fedorov Y.N., Koroteev V.A., Pecherkin M.F., Kormil'tsev V.V., Pogromskaya O.E., Ronkin Y.L. and Erokhin Y.V., Doklady Earth. Sci. 393, 647-651 (2004). Ivanov, A. V., Feoktistov, G.D., Rasskazov, S.V., Huaiyu, H. and Boven, A., (submitted). Jones, A. P., Price, G.D., Price, N.J., DeCarli, P.S. and Clegg, R.A., Earth Planet. Sci. Lett. 202, 551-561 (2002). Kamo, S. L., Czamanske, G.K. and Krogh, T.E., Geochimica et Cosmochimica Acta 60, 3505-3511 (1996). Kamo, S. L., Czamanske, G.K., Amelin, Y., Fedorenko, V.A., Davis, D.W. and Trofimov, V.R., Earth and Planetary Science Letters 214, 75-91 (2003). King, S. D. and Anderson, D.L., Earth Planet. Sci. Lett. 136, 269-279 (1995). King, S. D. and Anderson, D.L., Earth and Planetary Science Letters 160, 289-296 (1998). Kruk, N. N., Plotnikov, A.V., Vladimirov, A.G. and Kutolin, V.A., Doklady Akademii Nauk 369, 812-815 (1999). Lightfoot, P. C., Naldrett, A.J., Gorbachev, N.S., Doherty, W. and Fedorenko, V.A., Contribution to Mineralogy and Petrology 104, 631-644 (1990). Lightfoot, P. C., Hawkesworth, C.J., Hergt, J., Naldrett, A.J., Gorbachev, N.S., Fedorenko, V.A. and Doherty, W., Contribution to Mineralogy and Petrology 114, 171-188 (1993). Lur'ye, M. L. and Masaytis, V.L., In: Sobolev, V.S. (eds) Flood Basalts. Nauka, Moskow, pp. 13-26. (in Russian) (1964). Lyons, J. J., Coe, R.S., Zhao, X., Renne, P.R., Kazansky, A.Y, Izokh, A.E., Kungurtsev, L.V. and Mitrokhin, D.V., Journal of Geophysical research 107, 10.1029/2001JB000521 (2002). Nikishin, A. M., Ziegler, P.A., Abbott, D., Brunet, M.-F. and Cloetingh, S., Tectonophysics 351, 3-39 (2002). Reichow, M. K., Saunders, A.D., White, R.V., Pringle, M.S., Al'Mukhamedov, A.I., Medvedev, A.Ya., Kirda, N.P., Science 296, 1846-1849 (2002). Puffer, J.H. Geology 29, 675-678 (2001). Puckkov, V.N., Geoph. Res. Abstr., EGS - AGU - EUG Joint Assembly, Nice v.5,14510, (2003). Renne, P. R. and Basu, A.R., Science 253, 176-179 (1991). Renne, P. R., Zichao, Z., Richards, M.A., Black, M.T. and Basu, A.R., Science 269, 1413-1416 (1995). Saunders, A. D., England, R.W., Reichow, M.K. and White, R.V., (submitted). Sharma, M., Basu, A.R. and Nesterenko, G.V., Earth Planet. Sci. Lett. 113, 365-381 (1992). Sharma, M., In: Mahoney, J.J., Coffin, M.F., (eds) Large Igneous Provinces: Continental, Oceanic, and Planetary flood volcanism. Geophysical monograph 100. (1997). Shipilov, E. V., In: Evolution of the tectonic processes in the Earth's history. Novosibirsk, GEO, 304-307 (2004). Tanton, L. T. and Hager, B.H., Geophysical Research Letters 27, 3937-3940 (2000). Tuzhikova, V. I. and Kurbezhekova, A.N., Nauka, Moscow, pp. 150 (1973). Twitchett, R. J., Looy, C.V., Morante, R., Visscher, H. and Wignall, P.B., Geological Society of America 29, 351-354 (2001). Venkatesan, T. R., Kumar, A., Gopalan, K. and Al'Mukhamedov, A.I., Chemical Geology 138, 303-310 (1997). Wooden, J. L., Czamanske, G.K., Fedorenko, V.A., Arndt, N.T., Chauvel, C., Bouse, R.M., King, B.W., Knight, R.J. and Siems, D.F., Geochimica et Cosmochimica Acta 57, 3677-3704 (1993). Zolotukhin, V.V., Vilenskii A.M. and Dyuzhikov O.A., Nauka, Novosibirsk, pp. 245 (1986).